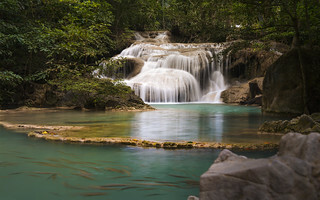 The first waterfall at the Erawan National Park. The name of the park comes from the seventh waterfall which is supposedly shaped like a three-headed white elephant (aka erawan). Never made it that far as it was sweaty and cloudy, good for taking the short circuit and taking photos without too much gear, and a dip in the water at the end. The streaks at the bottom of the photo are fish that are very curious about feet that enter the water.